Home News Politics Social Trends Duterte and Robedo as "Dubredo", Robredo laughs about it. Duterte and Robedo as "Dubredo", Robredo laughs about it. MANILA, Philippines — Vice President Leni Robredo on Monday, 04 July 2016 laughed off her “love team” with President Rodrigo Duterte paired by netizens. Netizens created the love team dubbed “Dubredo”, a portmanteau of Duterte and Robredo after their first meeting during the AFP (Armed Forces of the Philippines) turnover ceremony at Camp Aguinaldo in Quezon City last Friday. 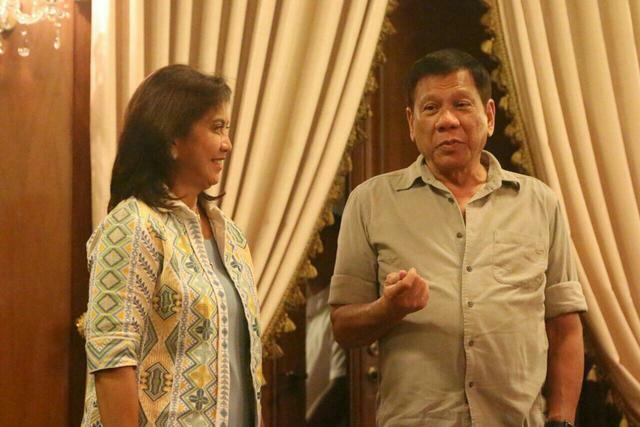 Memes and the hashtags #Dubredo and #RodNi circulated on social media platforms after photos of their first meeting and Robredo's courtesy call on the president at the Malacañang Palace on Monday were released. In an interview with ANC’s Talk Back, Robredo attributed the pairing to the public’s curiosity on the outcome of their meeting. Rpbredo said that "Palagay ko because over the course of more than a month parang all that was ever written about us was we weren't seeing eye to eye. When we finally met na mukhang maayos naman, I think many Filipinos were relieved,".. Even her daughters got excited to find out the result of her courtesy call on the president. She said what her daughters felt must be the same with other Filipinos. Robredo said. “Iyon ang first time and then this afternoon they knew I was visiting the president, iyon pala iyong mga anak ko nag-aabang yata sa Twitter. They were getting live feeds from I think RTVM. Tapos hindi pa ako nakakalabas ng gate, kasasakay ko lang sa car tumatawag na iyong anak ko nagpapakuwento na,” she said. Robredo admitted that she initially expected the worst during her first meeting with the president. She said she was afraid that she might be ignored by Duterte, but the outcome of the meeting exceeded her expectations. When she vowed to show respect to Duterte, the president asked her not to so she told him: "But you’re my boss, sir. ", Robredo said. Robredo also mentioned that President Rodrigo Duterte acknowledged her as a part of his administration. She said the president was "very humble." Accordingly, fortunate are those who fight with ex-Mayor Rodrigo Duterte, now Pres. Rodrigo Duterte, for they shall enjoy his protection! And I think, it's been, was and will always be that way now that he's the president of the Philippines! Respectful, humble, protector with stern spirit that he has been, was and will always be.. But for criminals, may God bless your souls if you're that fool & damned..